BEFORE they get into your home or business. Why go to a showroom when we bring the showroom to you? 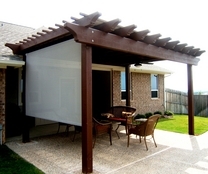 Sierra Shading has retractable awnings for every budget. 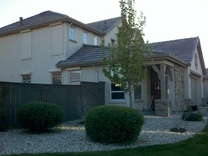 We are committed to providing the ultimate in custom solar protection. We take great pride in providing our customers with a wide range of state-of-the-art retractable awnings that can protect their families, homes and businesses from the heat, glare, harmful UV rays of the sun. 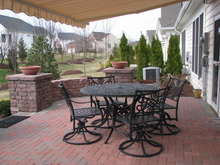 We strive to provide a quality retractable awning at a fair price and Eclipse allows us to do exactly this. We can provide you with entry level awnings for your home all the way up to a commmercial grade awning for your business. Your new retractable awning can be operated manually with a hand crank or electrically with a motor from Somfy. 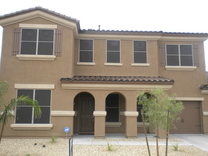 Sierra Shading can add protection, privacy, and insulation to your home's windows & doors. 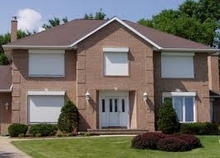 Rolling Shutters are installed on the outside of your home but are commonly operated from inside your home. The two most common types of operation are a manual rod crank or motorized with a remote control. Rolling Shutters provide a thermal barrier for your windows & doors to keep the heat out in the summer and the cold out in the winter. Rolling Shutters also provide security and peace of mind since they are incredibly tough, made of aluminum, and will deter almost any potential intruder. 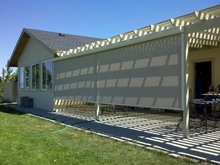 Sierra Shading can allow your family to enjoy the outdoors on your terms, even extend your living space to your patio. Retractable Solar Screens are custome made to your size requirements, provide shade, save energy, protect you from insects, protect your furnishings from fading, and allow ventilation all at the same time. Retractable Solar Screens are commonly installed on a patio or on the outside of a window and are electrically operated from anywhere with a wireless remote control. Retractable Solar Screens are designed to filter out the majority of the sun's harmful effects while preserving your view of the outdoors. 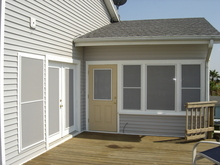 Sierra Shading offers an ideal and inexpensive solution to the glaring sun and its harmful effects. They will also save you up to 35% on your cooling costs. Framed Solar Screens can stop up to 90% of the sun's heat, UV rays, and glare from ever entering your home or business. This will protect and extend the life of your furniture, interior shading, and carpet from fading and discoloration. Framed Solar Screens are great for covering odd shaped windows, high windows, french doors, and sliding glass doors. Many of these are a "pain in the glass" for traditional window coverings.